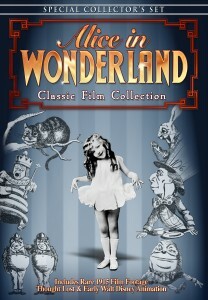 One of myriad Alice in Wonderland DVDs that came out when Tim Burton’s latest re-imagining of Lewis Carroll’s 1865 tale was released in theaters, Infinity’s Classic Film Collection is a quintet of Alice movies and short films that have been available from other DVD labels over the years but are here anthologized into one 3½-hour program. Kicking it off is a silent version from 1915 that isn’t as entertaining as it is a fascinating look at how early Hollywood adapted classic literary work via the relatively new technology of cinema. But there’s no denying that the primitive sets and strangely costumed characters are fantastical (and a bit funny). 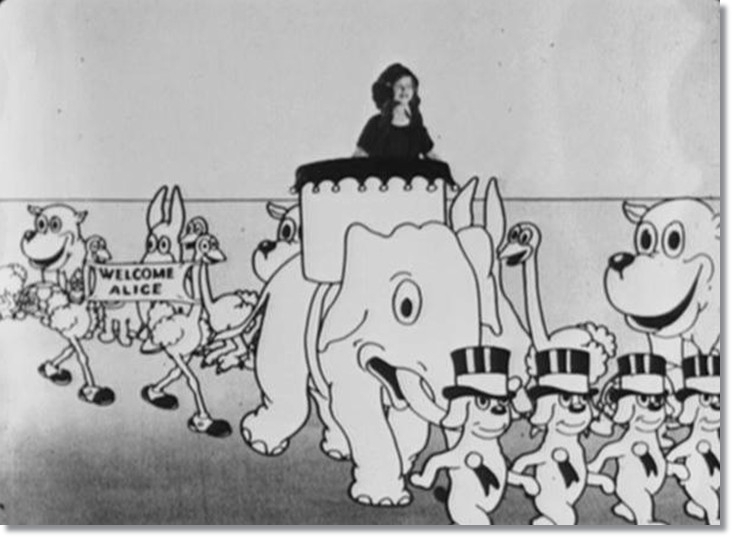 The DVD’s other animated offerings include a pair of short films from 1925, produced and directed by ambitious young filmmaker Walt Disney. Alice Rattled By Rats and Alice in the Jungle, starring Margie Gay and Virginia Davis (pictured above), respectively, aren’t all that concerned with the Wonderland tale but rather live-action Alice’s encounters with a host of animated animals, one of whom bears a striking resemblance to Felix the Cat. Like the earlier version, it’s not as much fun as it is an interesting look at the technology of the day, which, in this case, illustrates Disney’s early mixing of live action and animation. Alice of Wonderland in Paris, a 1964 French animated film, finds our little blond heroine traveling to the wonderland of Paris, where she encounters characters and situations from other popular children’s tales, including Anatole and Madeline. It’s a pleasant-enough, hour-long movie featuring low-end animation, but it’ll probably amuse the young ’uns in your home more than older viewers. 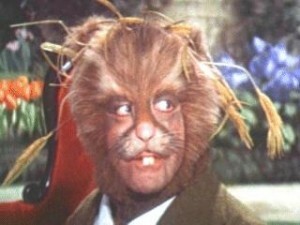 The most intriguing film of the bunch is the 1972 British musical Alice’s Adventures in Wonderland, which is filled with stylish sets and a cast that includes Peter Sellers (classic Pink Panther films) as the March Hare (pictured), Dame Flora Robson (Black Narcissus) as the Queen of Hearts and Dudley Moore (Arthur) as The Dormouse. The intrigue comes from the question of how this family-friendly film, directed by TV helmer William Sterling, can be so, well, boring. Th is looks really cool. I saw that Alice with Peter Sellers and it isn’t really that good like you said. I’ve heard about the Peter Sellers “Alice” but have never seen it. Can’t wait to check it out! 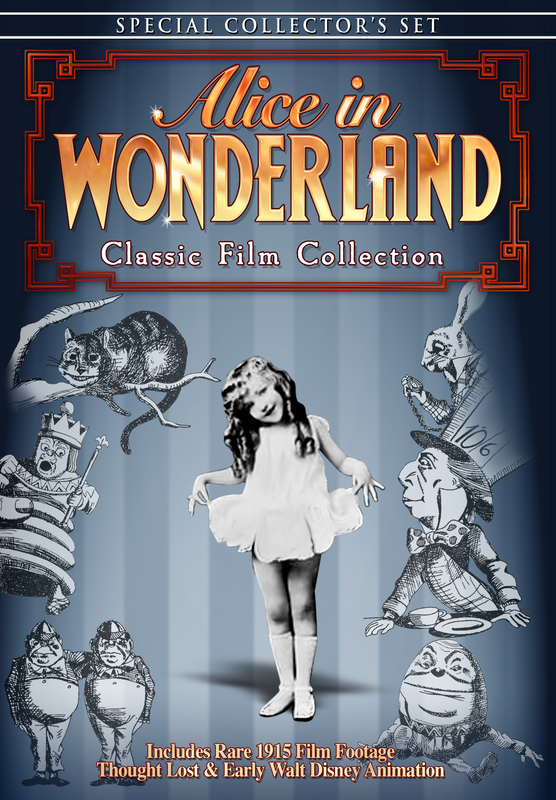 Good to see that a couple of the Disney Silent ALICE adventures are on this edition. But for a more comprehensive collection of these, check out the WALT DISNEY TREASURES limited edition DVD releases.